Can you make it to Fifty? You don't have to be nearing fifty or over fifty to know that life is fragile. But there is something about getting older that helps us realize our mortality and realize there are things we need to do or be before time runs out. I remember my GP congratulating me when I hit 50, and I thought, why would she say that? Recently, my 21 year old son had an ATV accident in Greece, and while he came out of it (10 days later) relatively unscathed, miraculously not brain damaged or incapacitated, he was unconscious and intubated for the first few immensely scary days, in an intensive care ward far away in Athens and then later in Frankfurt where he was brought by air ambulance for an operation. 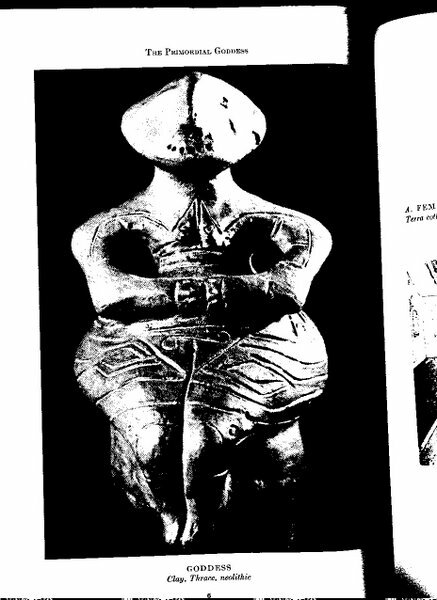 My husband and I flew to Athens to be with him, and entered that strange liminal space of not being sure from one day to the next what his condition was, or what his prognosis was. The second day we were there, they reduced the sedation and tried to remove the ventilator, and while he didn't open his eyes (or couldn't), he did squeeze his father's hand and give us a thumbs up. For which we rejoiced! Responding and all there, very good news. Over the next week, we had many ups and downs, many conflicting pieces of information about what would happen or needed to happen next, as they performed CT scans and checked his brain for swelling, his many fractures adding up, from below his left eye, his left jaw, double fracture in front of jaw, a broken rib, a bruised lung, two vertebrae broken, but not impacting the spinal cord....lots of trauma. We learned to live in the moment, and yet yearned to be able to bring him home to Montreal. I remember letting go to panic and anxiety a few times, lying there with my stomach muscles all squeezed tight in a ball, having a hard time sleeping. Or crouching in a hospital hallway crying, not able to handle the uncertainty anymore. Thank goodness my husband is the strong stoic type and only broke down in tears twice. Through that week, one thing held onto me. Or I held to it. Not sure who was doing the holding, but it was a great comfort to have a place inside to visit, to focus my mind and heart on, to not be totally swamped by the worst case scenarios playing out in my mind. Some mornings, since we were still jet lagged, it was hard to sit and practice meditation, and sometimes we just got up, showered and went to the hospital. But the moments of relief that came, as we learned more about his state of health, also brought a deep feeling of gratitude and connection. I'm not sure I handled myself very well all the time, what with all the changing medical staff, nurses doctors and physiotherapists, night staff, morning staff; or the ICU staff dramatically walking us back to the door with the bell, where we needed to wait and not just walk in to their controlled environment. Thank goodness a few personnel even spoke some English or we would have been more lost at sea. And for the insurance company logistics people in America, who had an open 24 hour line and revolving staff, who had a file on our son and knew where he was, mostly, and what he needed, mostly, and helped us decide where the best care for him would be and when it was safe to fly him home. It's been two weeks since the accident, and my son can now sit up and walk, feed himself, is almost off the painkillers, does not need a second operation for his jaw, although it's wired shut for 5 more weeks. My friend and neighbour's Vitamix blender is my new best friend. It's like feeding a baby bird, but a 160 pound, 6 foot tall one, who needs protein and feeding every two hours. Our friends sustained us with texts and emails and support and a very large network of prayers was holding my son in the light all that time. I'd like to say I have a new appreciation for my mortality, for all of our mortality, but I feel more like a first time mother with a newborn, noticing the dangers everywhere, slowing down and stopping fully at intersections, wanting to scream at anyone rollerblading without a helmet, noticing all the stupid ways we act dangerously, unconsciously, putting ourselves and others in danger. I feel newly raw and overwhelmed with the knowledge that life is so fragile, that a bad break a few centimetres closer to his spine could have left my son paralyzed or a vegetable. And also extremely grateful. I used to say when he was a teenager that I just wanted him to make it to age 21, to survive teenage-hood without too many broken bones and calamities. Now I want him to make it to at least 50, or older. I won't make any bets or deals, but I do want to appreciate all the moments we have left. And hopefully his GP will congratulate him when he turns 50. 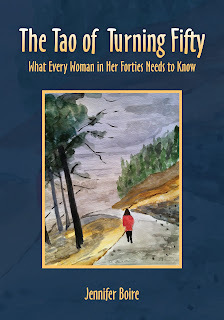 The Tao of Turning Fifty, What Every Woman in Her Forties Needs to Know - actually any one between 35 and 65 who wants to journal along with this workbook and discover exercises and prompts that encourage you towards taking better care of yourself, putting yourself on the list, and listening to your inner wisdom and body guidance, will benefit from this book. Various prices, starting at $14.99 and in Canada around $15.15. I am looking for someone to review this book in a major women's magazine, so if you have any connections that way, please let me know. One summer, while vacationing in Nantucket, I went down to the ocean with my teenage kids, to watch them body surfing and jumping through the 10 foot high waves. It looked like fun, my husband was joining them, but I hesitated on the edge, watching. In one brave moment, I decided to dive through a big wave and reach them on the other side, thinking I knew how, from observing them. Wham! I was pulled under, rolled around and sent into a spinning topsy turvy roll, struggling to get back to the sandy shore. My husband held out his hand to help me, only to get thrown on top of me, as we rolled over and over, unable to stand or catch our breath until the Wringer was done with us. Once I got back on my knees on the sand, gasping for air, I pulled up my bathing suit, shook the sand out of my bottom, and walked shakily back to the cottage to lie down for a while, thoroughly K-O'd by the ocean's powerful waves. A lesson in surrender, and a full Neti saltwater cleanse at the same time. 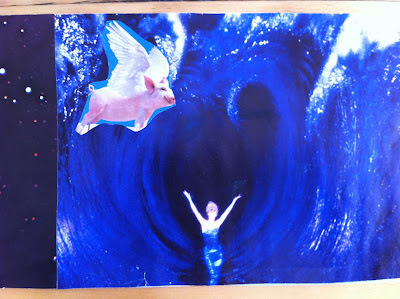 Recently I was looking at a SoulCollage(R) www.soulcollage.com card I made called Transcendence or Coming Through, which shows a big blue tsunami sized wave, and a woman in performer's mode, arms up, as if to say, Ta-Da! I made it through in one piece. Thinking back on my menopausal or mid-life journey, that is what it feels like now. Ta-Da! I'm ok now, I can breathe and stand on my own two feet. Made it through! I know the mid-life transition can feel that way for some women. It's like a huge wave that sends you rolling, topsy turvy, no longer sure there the sky is, where the ground is, where your center is. And make no mistake, you have to dive in to that wave, you can't really avoid it. But I want to reassure you, you will come out the other side, as long as you take time for yourself: lots of down time, slowing down to feel what you feel, taking notes, and allowing life to teach you whatever lessons it needs to show you. There's no point avoiding the work you need to do - there's no point shutting down your emotions, withdrawing from the process. This is major roadwork - renovations are underway. You are not the project manager, you are the house being renovated. Or so it feels like sometimes. As Alexandra Pope says in her wonderful book The Wild Genie http://wildgenie.com/ you have to go down and in before you can come up and out. Face the fears, the demons, give yourself some stretching time to be in your body, do some yoga or tai chi, let yourself write down what you need, allow yourself to imagine what you love, what would really bring you alive, get in touch with your wild feminine landscape - your inner creative fire. Don't fall back asleep - this beautiful transformation called mid-life is a wake-up call to a deeper, more authentic you. 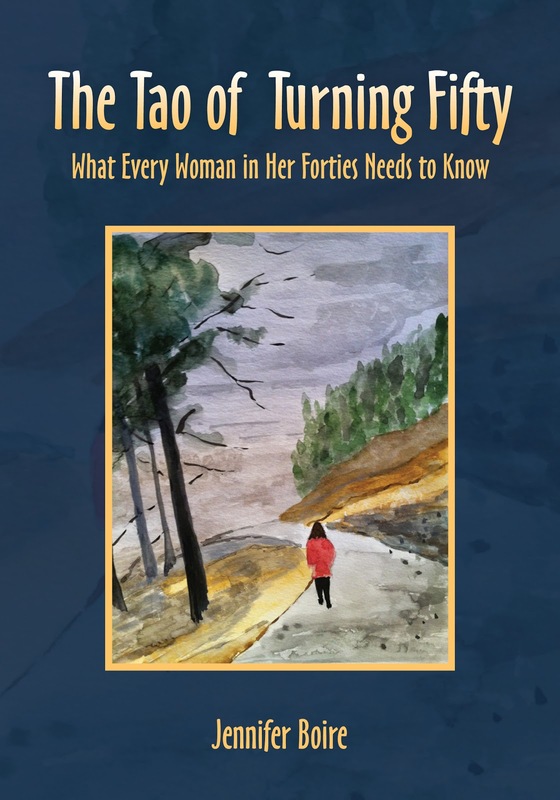 You will make it through the wringer - find some friends to talk with, read all the books and blogs you can find, and perhaps even look into The Tao of Turning Fifty, written by a woman who has been through the wringer and now can say, Ta-Da!